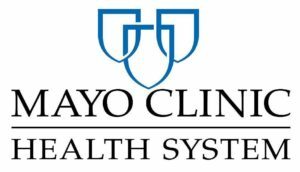 Victory Over Violence, presented by Gundersen Health System, is a community coming together to help end domestic violence, sexual assault, and human trafficking. 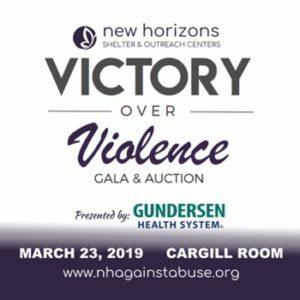 Victory Over Violence Gala & Auction is many things–including New Horizons’ largest fundraiser of the year! We hope you will join us–Saturday, March 23rd at the Cargill Room at the Waterfront Restaurant & Tavern starting at 5:30pm. We’ll have live music, delicious food, amazing items to win, and incredible finds on the live auction! Tickets are just $40 and are on sale now via the link at the bottom of this page. Dave Skogen, Chairman of Festival Foods and advocate of Servant Leadership will be the keynote speaker. In addition to running a successful chain of grocery stores, Skogen and his wife, Barbara have been instrumental supporters in many community projects. Everything they do is rooted in the concept of Servant Leadership. Skogen believes we are created to serve others in all that we do. He follows the philosophy that in order to be a leader, one must first be a servant to others. You don’t want to miss his inspiring talk at this year’s Victory Over Violence Gala and Auction. And as mentioned, we will have some incredibly unique and rare items up for bid on our live auction! All autographed items come with Certificates of Authenticity. Green Bay Packer helmet autographed by Aaron Rodgers, Brett Favre, Bart Starr, Mike Holmgren, Clay Matthews, James Lofton, Sterling Sharpe, Antonio Freeman, Ahman Green, & Dorsey Levens. Great Harvest Bread Company – a gift basket full of goodies! Pink Fusion Spices – Several amazing spice gift baskets–AND one incredible Himalayan salt spa basket! Ship Shape Car Wash – LOTS of car wash opportunities–perfect for this time of year with all of the slush and salt on the roads! Jones Farm Clydesdales – One hour wagon ride through the countryside this fall with lots of extras in the package too! Picaboo – $50 gift certificates for custom photobooks, cards, calendars, and more! We hope you can join us at The Cargill Room at the Waterfront Restaurant & Tavern in La Crosse, Saturday, March 23rd! 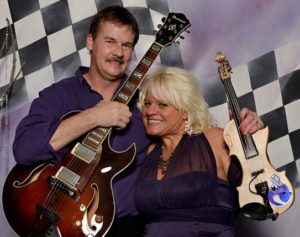 There will be heavy hors d’oeuvres to nosh on beginning at 5:30pm–as well as live music from the duo, “Me & Rosie B!” that you’re sure to enjoy. In addition to the live auction, you’ll be able to purchase tickets for a “Pick-A-Prize Raffle,” and several 50-50 cash drawings will be taking place throughout the night as well. The dress code is cocktail attire–and we’ll have a professional photographer set up to take your photo on the “purple carpet” as you enter the Cargill Room. We hope you can join us for this extremely fun and important event for New Horizons Shelter & Outreach Centers! Additional support from Altra Federal Credit Union & US Bank.